The system is available in 1-metre black lengths and the plastic version is manufactured from a 100% recycled plastic material and provides a strong and reliable solution for domestic surface water drainage. 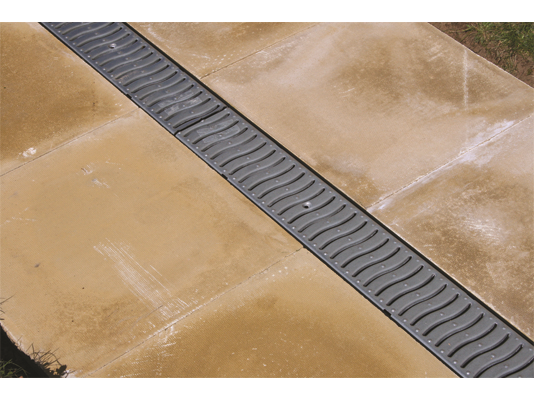 FloDrain has the benefit of a heel guard grate incorporated into the design of the product. In addition, the grate has a slip-resistant finish that provides additional grip in all weather conditions and reduces the chances of slipping. Additional features include an easy to use channel-to-channel locking system that allows the user to securely click multiple channels into place for easy assembly and handling. FloDrain can be applied around many domestic areas where surface water collects including driveways and pathways. Patios and conservatories. Swimming pools and sports areas. Gardens and water features. Retaining walls. Easy to assemble, handle and install with no special tools required. Recycled material providing environmental benefits (plastic version). Built-in heel guard and anti-slip system (plastic version). Simple click into place positive connection. Innovative, lightweight and durable design. Concave design for easy water flow. Low maintenance required by the user. Easy access for channel cleaning. 5 outlet option for multiple FloDrain channel connections. Quad connector for multiple changes of directions. 1. Dig a trench for FloDrain, allowing for 50mm deep compacted sand base and wide enough for a minimum of 100mm backfill of concrete on each side. 2. Fix a string line to finishing height of grate 2mm below final surface level. 3. Allow a fall of approx. 5mm for every 1m length (1:200). 4. Start installation at the lowest point of the run to accommodate any cut lengths which should be installed at the point furthest from the outlet. 5. FloDrain joints and end caps to be sealed with silicone sealant. 6. Use an End Cap at the highest point of FloDrain. 7. Connect the lowest end of FloDrain to 110mm PVC-U BS EN1401 drainage pipe using either an end outlet or the preformed channel bottom outlet to allow water to drain away. Contact FloPlast for additional coupling details for other connections e.g. clay pipes etc. 8. FloDrain can be cut to length with a hacksaw. Install with grate fitted. 9. Protect grate with tape before concrete is poured. 10. Finish concrete 2mm above the level of the grate. 11. Allow 72 hours to cure before vehicle use or removing grates. 12. To remove the grate, simply run a screwdriver along the edge of the grate to dislodge. 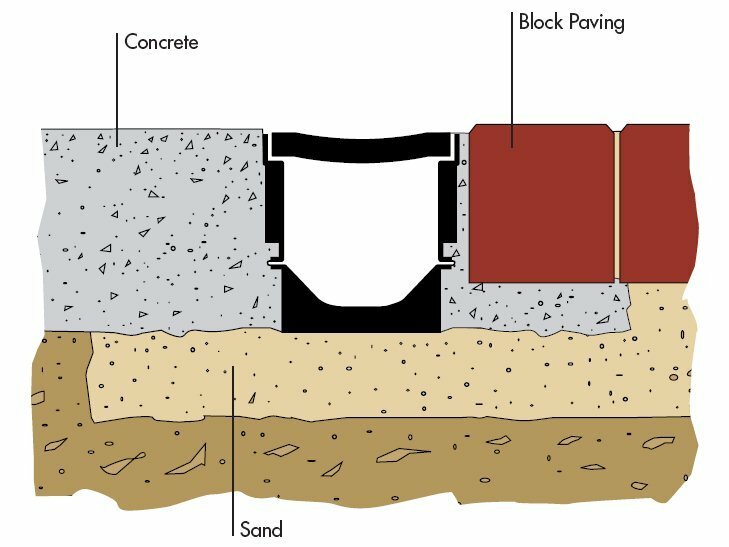 13.If installing block paving or paving slabs, haunch around the channel with concrete to a height which allows the depth of the block or slab to finish 2mm above the level of the grate. All FloDrain Installations must be set in Concrete. ( 2per 1 meter length) are required. Domestic Channel Drainage Garage pack. Quality domestic surface drainage 110mm x 100mm Anti-slip heel guard grating designed to withstand 5 tonne vehicle weight 4 outlets per length for maximum flexibility. Suitable for Driveways and pathways Patios and conservatories S.. Description: Flodrain Surface Channel Features: 1m length. Can connect direct to 110mm drain. Moulded knock out bottom outlet. Universal end cap and outlet combined Debis trap preventing drain blockage. Moulded in high grade recycled polypropylene. Dimensions: Length = 1m .. Description: Flodrain Channel Drain with Galvanised Grate 1m. Linkable channel drain system. Set into the ground at surface level to drain water away. Suitable for domestic areas where surface water collects such as driveways, pathways, patios and swimming pools. Installation Guide .. Description: Flodrain Drain Corner with Galvanised Grate Manufacturer: .. Description: Flodrain End Cap- for use with Flodrain Surface Channel Domestic channel drainage for domestic areas where surface water collects. End cap for 110mm pipe. Easy to use channel to channel locking system with concave grid for maximum flow. 5-tonne load rating. Manufacturer: &nb.. Description: Flodrain - End Cap Outlet- for use with Flodrain Surface Channel Installation Guide .. Description: Flodrain Corner- for use with Flodrain Surface Channel. Domestic channel drainage for areas where surface water collects. Easy method to create corners, tees or 4-way junctions. Easy to use channel to channel locking system with concave grid for maximum flow. 5-tonne load ratin..